A 5th round pick of the Arizona Cardinals out of Oklahoma State at 6’4″, 282. 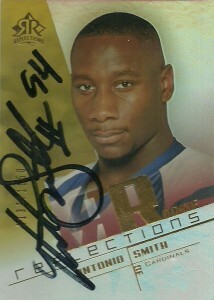 After not starting any games his rookie season in 2004, Smith would be penciled in at right defensive end, starting 8 games. He’d make 3 sacks and 16 tackles. His time at defensive end over the next 3 seasons would continue to grow, and he’d have an impact post season helping the Cardinals make their first Super Bowl appearance in 2008. In 2009 Antonio Smith would sign with the Houston Texans to play opposite Mario Williams in the lineup. In 2 seasons he’s made 8.5 sacks, forced 3 fumbles, and 49 tackles. With the team’s planned conversion to the 3-4 in 2011, Antonio’s job appears secure as the team hopes he will buy into the new defensive scheme.